A bowl of this dish with rice makes a very simple, tasty and healthy dinner. It is delicious yet easy and simple to cook. 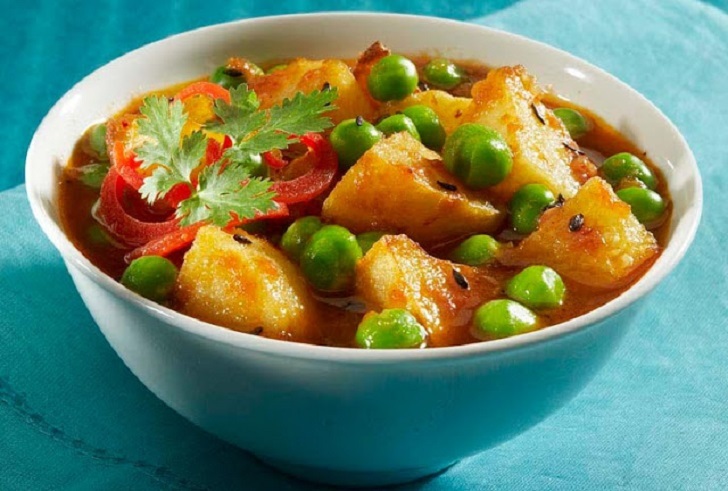 It is a simple yet highly favorable dish. 1. Add a small amount of oil in a wok or cooking pot and shallow fry the potatoes for about 3 minutes, then add in the onions, garlic, mixed spices and paprika, black pepper, cayenne pepper and continue to stir until the onions are slightly golden brown. 2. Proceed to add the tomatoes and tomato paste and continue to cook for about 2 minutes before adding the bell pepper, green peas, and salt to taste. 3. Add the chicken stock, stir, cover and let it simmer until the potatoes are cooked through. Add the chopped dhania, stir for about 30 seconds. 4. Serve with Coconut rice.